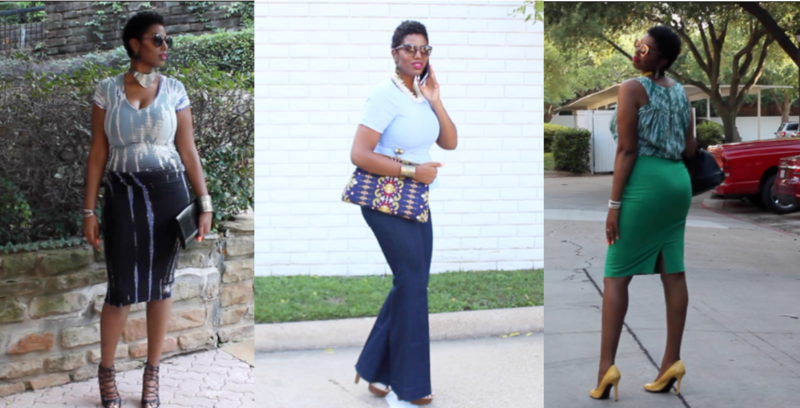 If you’ve followed my blog since the beginning, you know I’m a fan of style. I love exploring my own personal style and trying out new trends as well. In July, when it was a few degrees cooler I put these outfits together. These 100 degree PLUS days in Dallas, however, have me contemplating walking around looking like a THOT. Honestly. Truly. Nonetheless, whether it be a cool summer day, a day at work or a chic pool party I’ve got some ideas for you to draw inspiration from. Bonus? A video OOTD video at the end of this post. YAY! Outfit #1 is for a any occasion on a cool summer day. A casual dinner, happy hour, even some shopping (if you shop in heels like I do from time to time). Outfit #2 is an outfit perfect for a summer day. Of course if your office gets cold you can throw on a cardigan or light sweater. My go to pop of color is yellow and I LOVE this necklace I snagged from a store in Harlem. Legally. Outfit #3 is my favorite! I love a dress! Give me ANY excuse to wear a comfy dress and I’m there. This one is from one of my favorite brands, YBF. This outfit works for a night out on the town, a chic pool party or even a cruise night. I hope you enjoyed this post! Do you like blog posts featuring my outfits? Want to see more of them? The only way I know what you want to see is if you TELL me! Make sure to comment below!